Four hostages have been killed at HyperCacher as anti-terror forces stormed the Jewish supermarket in eastern Paris. 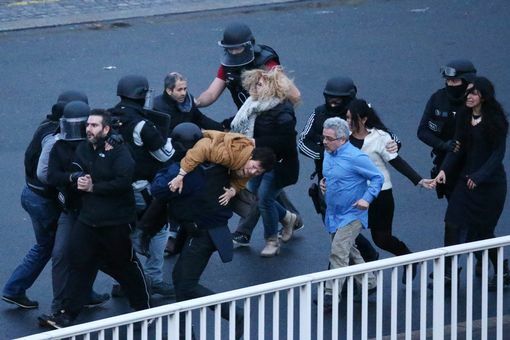 Several hostages were being held by a gunman with links to Charlie Hebdo attack suspects. It is not clear whether the four hostages were killed before or after the police assault began. Another four hostages were seriously injured, but 15 were freed alive. After the police operation started, several hostages could be seen leaving the HyperCacher supermarket. Two police officers were injured in the rescue operation, AP reported. In a separate incident, a hostage at the warehouse in Dammartin-en-Goele, 22 miles north of Paris was also freed, while a police officer at the scene was injured, AFP news agency said. Charlie Hebdo attack suspects Cherif and Said Kouachi have been killed in the incident. French President Francois Hollande has described the events as “a tragedy for the nation”. In a national address, Francois Hollande thanked the security forces for their “courage, bravery [and] efficiency”, but added that France still faced threats. “We have to be vigilant. I also ask you to be united – it’s our best weapon,” he said. Twelve people were shot dead and 11 were injured in Wednesday’s attack on the office of Charlie Hebdo magazine. The two suspects of the Charlie Hebdo shootings, brothers Cherif and Said Kouachi, then went on the run for two days, before being surrounded at Dammartin as night fell on Friday. French police said they came out firing. The hostage taker in eastern Paris targeted Jewish supermarket HyperCacher, near Porte de Vincennes. He has been named as Amedy Coulibaly, 32. It is not clear whether he had an accomplice. He knew at least one of the suspected Charlie Hebdo attackers, a source told AFP news agency. Amedy Coulibaly had threatened to kill his captives if police attempted to capture the brothers, reports citing police said. Amedy Coulibaly was also suspected of being behind the shooting of a policewoman in the southern suburb of Montrouge on January 8. On January 9, French police issued an appeal for witnesses to that shooting. They said they were looking for Amedy Coulibaly, as well as a woman called Hayat Boumeddiene, 26. Hayat Boumeddiene’s whereabouts are not clear. Reham Khan: Who is Imran Khan's new wife?